Air is a mixture of mostly oxygen, nitrogen and water vapor. 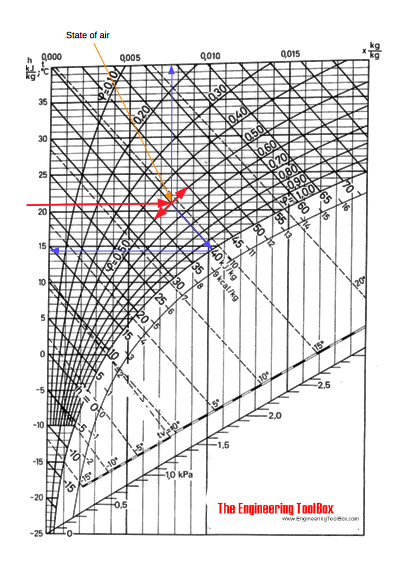 The Mollier diagram is a graphic representation of the relationship between air temperature, moisture content and enthalpy, and is a basic design tool for building engineers and designers. The Mollier diagram is a variant of the psychrometric chart. From the Mollier chart the enthalpy of the moist air is approximately 40 kJ/kg. The wet bulb temperature is approximately 14.5 oC. The specific humidity is approximately 0.0076 kg/kg. From the chart we can see that the enthalpy of the air is approximately 33 kJ/kg and the specific humidity is approximately 0.0056 kg/kg. Engineering ToolBox, (2003). Mollier Diagram. [online] Available at: https://www.engineeringtoolbox.com/psychrometric-chart-mollier-d_27.html [Accessed Day Mo. Year].